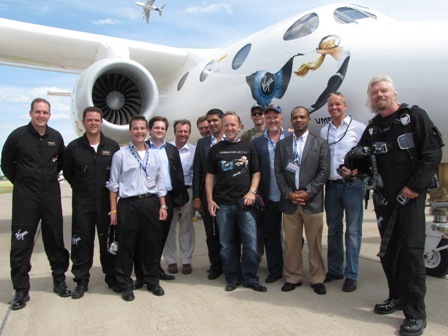 It’s been quite a while since we’ve checked in with our friends over at Aabar Investments, the Abu Dhabi-owned sovereign wealth fund that invested $390 million into Virgin Galactic in exchange for a 37.6-percent share of Sir Richard Branson’s space line. And boy, do I wish we had checked in sooner. There’s been some real serious [expletive deleted] going down with that investment with that fund over the past year. Real serious you know what. Khadem Al Qubaisi — who formerly headed up Aabar’s parent company, International Petroleum Investment Company (IPIC) — was arrested earlier this month in Abu Dhabi in connection with what officials allege was a multi-billion dollar fraud perpetuated against a Malaysian government sovereign wealth fund. Khadem was removed from state-owned IPIC last year; his assets were frozen by the United Arab Emirates central bank, and he was forbidden to leave the country. Mohamed Badawy Al Husseiny, the Aabar CEO who signed the investment agreement with Branson during a ceremony at Oshkosh in 2009, also left his position last year. Mohamed Badawy‘s assets also have been frozen and he has been forbidden to leave the country. Before going further, let me stress there’s no evidence of any involvement by Virgin Galactic, the Virgin Group or Branson in any of the alleged wrongdoing. It strictly involves the company’s Abu Dhabi partner. The widening scandal — which had led to investigations in five countries — involves a transfer of $3.5 billion from Malaysia’s 1MDB development fund to an entity based in the British Virgin Islands that had a name similar to Aabar Investments. They had neither received any payments from the BVI company, which was wound up last June, nor assumed any liabilities on its behalf, the statement said…. In response to IPIC’s statement, 1MDB said it was surprised that neither IPIC nor Aabar had any knowledge of payments 1MDB made to Aabar BVI. The 1IMDB fund says its records show documentary evidence of the ownership of Aabar BVI and of each payment made. The statement did not say what that ownership was. It added that legal agreements were negotiated with Khadem Al Qubaisi in his capacity as managing director of IPIC and chairman of Aabar or with Mohamed Badawy Al Husseiny, who was CEO of Aabar. Investigators have spent months trying to determine exactly what happened to the money after it reached BVI and who was involved with the entity that accepted the funds. U.S. investigators are currently broadening their probe into Mr. Qubaisi’s dealings and funds they suspect he took control of through the alleged fraud, according to people familiar with the probe. The Justice Department filed civil lawsuits last month seeking to freeze about $100 million of real estate in the U.S. that he allegedly bought with money embezzled from 1MDB, a fund set up in 2009 to boost Malaysia’s economy. In following what the Justice Department says is a $470 million money trail that stretches from Malaysia to Abu Dhabi to the British Virgin Islands, investigators now are looking for any connections to a company that vaulted to the top of the Las Vegas nightclub scene with two $100 million venues, the people said. Investigators also are trying to determine if Mr. Qubaisi used funds originating from 1MDB to help finance the world’s fifth-biggest yacht, according to people familiar with the probe. Meanwhile, a Luxembourg news outlet reported last week that a massive raid involving more than 90 people took place at the end of June at the headquarters of the private bank Edmond de Rothschild (BPERE). The cause of the Luxembourg investigation lies with the banking transactions carried out by the bank CEO Marc Ambroisien on behalf of the now arrested former IPIC boss Khadem Al Qubaisi (KAQ). As earlier exposed by Sarawak Report, Ambroisien, who has now been sacked, managed a web of private companies for KAQ, both during and after his role as Chief Executive of the bank, using off-shore secrecy to hide their activities. Ambroisien remained director of these companies and also a number of French property holding companies on KAQ’s behalf until just a few days ago. Sarawak Report has demonstrated how through these companies stolen 1MDB money was used to fund multi-million dollar payments for the purchase of the Topaz super-yacht attributed to the Abu Dhabi Sheikh Mansour, but used by KAQ and his circle of friends, including Jho Low and Leo di Caprio. Mansour is deputy prime minister of the United Arab Emirates and a member of the Abu Dhabi ruling family. He also controls Hakkasan Ltd., the company that owns the two new $100 million Las Vegas nightclubs. Officials told the Wall Street Journal that there are no allegations of wrongdoing against Hakkasan and its employees. Probably won’t mean much from VG’s perspective, other than additional rounds of funding from that source probably isn’t forthcoming. The stake in the company will simply pass to one or several different owners once it all gets sorted out in the courts. I would like to know more about the relationship between Khadem Al Qubaisi and Sir Richard Branson. And the relevance of these events to NewSpace activities is what exactly? the possible impact on VG could be quite high. Right now, he is saying that it is unknown. So one group of Muslims screwed over another group of Muslims. Talk about your “dog bites man” story!